I know you know this, but rest and laziness (or resting on one’s laurels!) aren’t the same thing. Where would we be if we didn’t sleep every night? We might make it for a day or two, or even more, but there’s a limit to how far we could go, or what we could accomplish. At my daily work, when I start dropping my tools into the water, I know it’s time for a break — before I get back at it! You’re right on that, Linda. Rest is not the same as laziness. I think I’ve built in enough rest (and hopefully relaxation) to maintain a healthy balance that will sustain a long career. But there are times when lazy creeps in and whole days are spent in avoiding actually getting to work. I remember that phenomenon well from the first year of being self-employed. It takes great discipline to forgo that afternoon nap when there’s no “boss” to tell you what to do. Take a day, read a book, walk the dog, go out for lunch, collect a few baubles and treasures Nature leaves lying in our path. A lazy day isn’t forever. It’s a pause. Judging from the blog I read 7 days a week, it sounds like you paint that many days. Take a day. Chill. I do have built in timeouts even when I am painting every day and do have other outlets. But I think the laziness I am talking about here is more about feeling content in where one is as an artist and resting on one’s laurels. Staying at a static point and not pushing to find something new in the work. Once you’ve reached a certain plateau, it’s way too easy to stay at that plateau and not push yourself to climb a little higher. 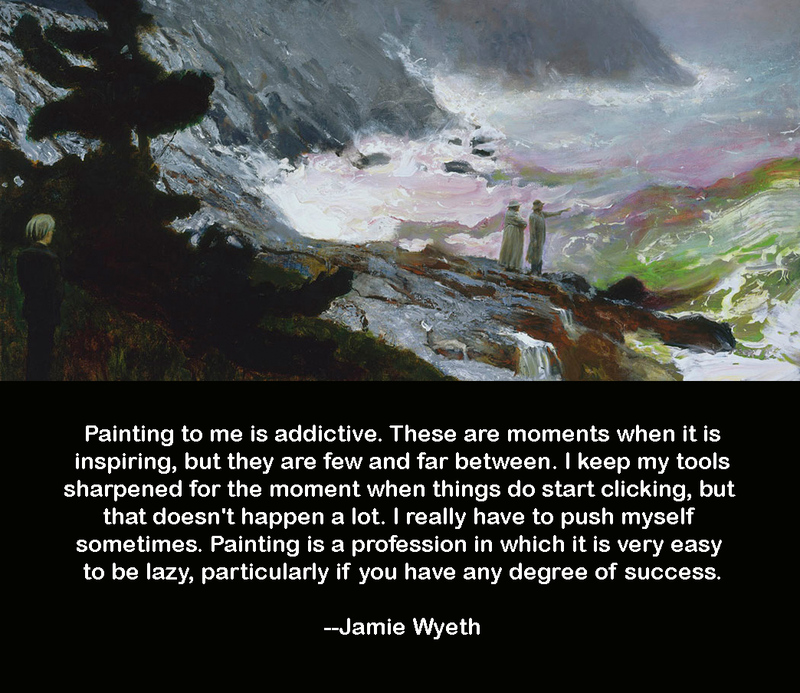 I think that’s the gist of Wyeth’s comment. But thanks for watching out for me!